It seems fitting that our issue is being released this week because this Thursday is Persian New Year. 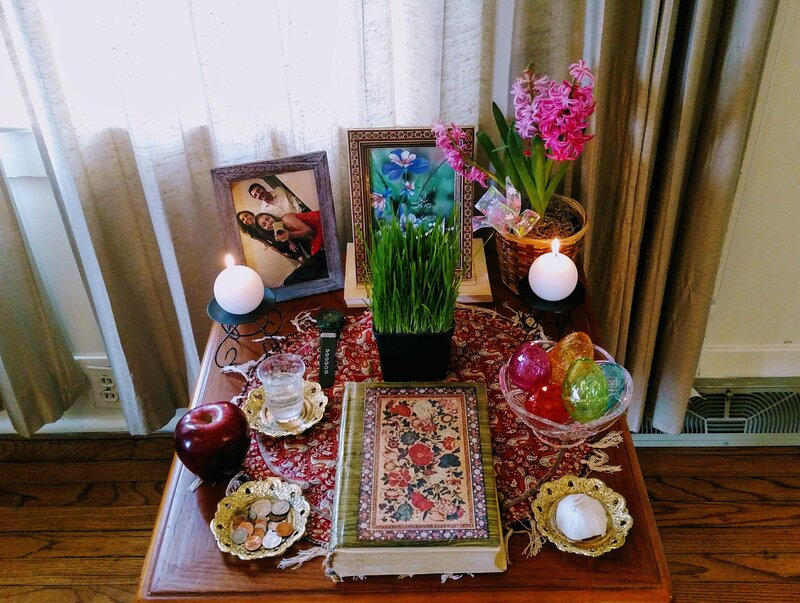 For Iranians, Noruz is celebrated on the first day of spring, which is something I have always loved. If the new year that began in January isn’t really turning out so good, if all those promises I had hoped to keep for myself end up dropping one by one like rotting fruit on trees, then that protracted year was ending (in some sense) and I could get a do-over, a whole other New Year to try again. In March, on the first day of spring no less, I was given a second chance to reinstate the resolutions I couldn’t conquer before: quit biting my nails, write more, eat healthier, write more, spend less money, write more (you know how this goes). Springtime also represents renewal and change, a reminder from the entire Earth to celebrate growth. Punctuate.has also been growing, and changing, and we eagerly look for what summers will follow our springs. But first, we’d like to thank T. Clutch Fleischmann for being a critical resource and dedicated reader as our Book Reviews Editor from 2015-2018. We’d also like to thank Ian Morris for his tireless work as Managing Editor and congratulate him on his new position as a writer at Coalition Technologies. 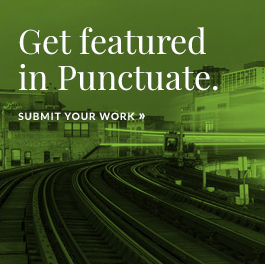 Since 2019, Cora Jacobs has handled Punctuate.as our Managing Editor and continues to manage Columbia Poetry Reviewand Hair Trigger, which are some of our sister publications. This year we also have Juliana Ravelli (Assistant Managing Editor) and Andrew Krzak (Editorial Assistant). To celebrate Noruz, Iranians lay out a sofre. On the sofre, which is usually an elaborately embroidered cloth, my family sets out seven items such as apples to represent health and beauty; eggs (which we also decorated for Easter) to represent fertility; and a small green plant called a sabzi for rebirth. Taken together, all the items represent some aspect of spring and the wishes we hope will come true in the new year. In this issue, our sofre is laid out with different prose to convey how expansive and ever-evolving the nonfiction genre can be. We are privileged to be publishing Elizabeth Kadestsky’s first nonfiction comics, which is accompanied by a Q&A with Juliana discussing how Kadetsky rediscovered visual, semi-textual modes of storytelling. Jane Babson’s “Lost and Re-Found” maps the terrain of memory alongside a meditation on her son’s Chromosome 7. In “Birth Story,” Kirsten Voris juxtaposes her birth with a disjunctive timeline of her mother’s life. Our last feature “For Sale: Death and Coyote Jaws,” by Laura Manardo, is poignant and powerful as she recounts the time her therapist advised her to do something that scared her. “Out of the ash/I rise with my red hair/And I eat men like air” are the last lines to Sylvia Plath’s “Lady Lazarus,” and Columbia College Chicago alum Negesti Kaudo interviews Piper J. Daniels (also a CCC alum) on Ladies Lazarus, her award-winning collection of essays from Tarpaulin Sky. They discuss Daniels’ relationship to Plath and how her collection of essays, too, went through several rebirths — from suicide note to monograph to hybrid work. If you come back on April 1, we’ll also be publishing two book reviews: Gretchen Lida reviews Randon Billings Noble’s Be with Me Always(University of Nebraska Press) and Kelsey Hoff covers The Collected Schizophrenias (Graywolf Press) by Esme Weijun Wang. Another thing I love about celebrating the Persian New Year is that it conveys a certain looseness to time. Although it is 2019 in the Gregorian calendar, one can also follow the official calendar in Iran, the Solar Hijri, where it’s 1397 (that is, until March 21, 2019, when the year turns to 1398). Additionally, the new year is never fixed on one day, but rather, the new year changes because the first day of spring always changes. More specifically, the new year oscillates between the March 19-22 range. In this sense, time (or Time) is not an absolute; instead, it embodies and is embodied across a spectrum where one can shift through different modes and interpretations. Genre, I believe, works similarly to time. Although the concept of “genre” can be used as a totalizing force, as yet another method to create, retain, and even reify the salience of categories, nonfiction reveals again and again that its variation cannot be contained. In conjunction with our book reviews, interviews and blog posts, we want to work with our writers and readers to cultivate this endlessly growing field of nonfiction. We hope you join us.